WASHINGTON — Newly released emails show Environmental Protection Agency Administrator Scott Pruitt personally monitored efforts last year to excise much of the information about climate change from the agency’s website, especially President Obama’s signature effort to reduce planet-warming carbon emissions from coal-fired power plants. The emails show then-newly arrived political appointees in the agency’s press office directing career staffers to make a list of changes to epa.gov. The internal EPA messages from April 2017 were released earlier this week following a Freedom of Information Act request filed by the advocacy group Environmental Defense Fund. They show then-newly arrived political appointees in the agency’s press office directing career staffers to make a list of changes to epa.gov. The emails show Pruitt wanted the updates to appear as soon as possible and had specific changes he wanted made. John Konkus, a former Republican campaign operative hired as EPA’s deputy associate administrator for Public Affairs, emailed staffers on the evening of Saturday, April 1. Four days before the email, President Donald Trump signed an executive order on energy independence that included a directive to start the process of rescinding the Clean Power Plan and other environmental regulations that “potentially burden” the domestic production of fossil fuels. 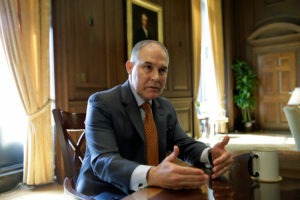 Konkus’ message triggered a flurry of emails over the following days about extensive changes to the agency’s web pages, including some edits ordered directly by Pruitt. Among the changes were stripping away data about climate change and modifying search results for “Clean Power Plan” to feature a page touting Trump’s executive order featuring a photo of the president posing with smiling coal miners, Pruitt and other members of his cabinet. EPA began its formal repeal of the Clean Power Plan in October. President Trump also announced last summer he intends to withdraw from the Paris climate accord signed by Obama in 2015, potentially making the United States the only nation in the world that is no longer committed to reducing carbon emissions under the landmark international agreement. Pruitt previously served as Oklahoma’s attorney general, a post where he repeatedly sued EPA to block stricter environmental regulations while reaping political donations from the state’s powerful oil and gas industry. Like Trump, Pruitt has publicly questioned the veracity of evidence complied by climate scientists, including those in his own agency, that global warming is overwhelmingly caused by man-made carbon emissions from burning fossil fuels. “You can tell him we have already mocked it up, and are just finishing up. Should happen this week,” replied J.P. Freire, then EPA’s associate administrator for public affairs and a former GOP congressional staffer. “Just asking because he is asking …,” Ferguson emailed back. Versions of the edited pages are still available on an archived “snapshot” of EPA’s website as it appeared prior to Trump’s inauguration, but those pages are no longer updated and many links to the underlying documents and data are now broken, leading to error messages. EPA spokesman Jahan Wilcox said Thursday that staff is constantly updating the agency’s website to reflect new initiatives. The changes made to epa.gov last year sparked widespread concern from scientists, environmentalists and others worried a key public repository of information and data about climate change was being lost. A coalition of scientific and academic groups rushed to make copies of the government webpages before they disappeared. The Environmental Data & Governance Initiative, which tracks changes to thousands of government websites under the Trump administration, says over 200 webpages providing climate information have been omitted from epa.gov over the last year. Other pages, including the agency’s homepage, have been substantially altered to removing mentions of climate and climate change.